The words “canker sore” are enough to inspire cold fear in some people. If you’ve ever suffered from canker sores, you know how debilitating they can be: a lightning bolt of pain striking you every time you try to eat or talk. Canker sores are painful ulcers found in the soft tissue of the base of the gums. Canker sores are also called mouth ulcers or aphthous ulcers. Sometimes canker sores show up alone or sometimes they show up with a cluster of their friends. To get relief fast, it is important to know the symptoms in order to start treatment. Before a canker sore pops up, some people might experience a tingle or burn in their mouth 24 hours before the legion appears. A red bump will appear. Usually, after a day or two, the red bump will burst, leaving a shallow yellowish, gray, or white wound with a red border. These sores make it difficult to eat and drink. Many people will find it painful to talk, as your teeth my rub up against the wound. If these symptoms carry on for three weeks, you have a fever, or if they start to spread throughout out your mouth, contact your physician or dentist. Often canker sores are mistaken for cold sores, however, in order to successfully treat the condition, it is important to accurately diagnose it. Cold sores are small red blisters that appear on the outside of the lip and the facial region. Unlike canker sores, cold sores are extremely contagious and are often the result of the Herpes Simplex virus type 1. You cannot get a canker sore through direct contact with another person suffering from canker sores. Again to be clear –canker sores are not contagious! More often then not, canker sores will heal on their own within a week or two. It is still unclear what exactly causes canker sores, although there are some speculations. They can affect anyone of any age, at any time of their life. Stress: Stress and canker sores are often linked. So if a crop of canker sores pops up around exams time or any other time you may be experiencing a heightened level of anxiety, canker sores may be a physical manifestation of your stress. Diet: Poor diet can cause a cluster of canker sores to appear if you’re not careful. Not getting enough B12 vitamins and iron deficiencies are known to be a contributing factor to developing canker sores. Allergies: Consuming some foods can cause a canker sore outbreak if you’re allergic to them. Hot food: Eating really hot food can cause trauma to the soft tissue of your mouth, sometimes resulting in a canker sore. Genetics: Although canker sores are not contagious, doctors have found that they often run in families. So if your parents or siblings suffer from canker sores, there’s a chance you may suffer from them too. Gender: Women are twice as likely to develop canker sores as men. Research has found that the difference may be between male and female hormones, as women are more likely to develop canker sores during certain times in their menstrual cycle. Illness: People suffering from illness or have a compromised immune system may find themselves more vulnerable to canker sore outbreaks. Sodium lauryl sulfate: Products containing SLS are associated with canker sores. SLS is a foaming agent found in most toothpaste and mouthwashes and research suggests they are suspect in causing some people to suffer from canker sores. Rough tooth brushing: Vigorously brushing your teeth may not only cause bleeding gums, but it can also lead to canker sores. So go easy, your gums are delicate! Dentures and braces: Having braces or wearing dentures can create a traumatic environment for your sensitive gums. A canker sore outbreak may be a sign that your gums are having a rough time adjusting to the new hardware in your mouth. Being hit in the mouth: Getting hit in the mouth may not just affect the tissue and skin on the outside, but may affect the soft tissues on the inside of your mouth as well. If you suffer from canker sores, there are steps you can take to prevent them. Many people believe that when your body chemistry is not properly balanced, canker sores can flourish. When your body is dealing with too much stress and too many acidic foods, your body is in what is known as an acidic state, making it more vulnerable to disease and viruses. To make your body more alkaline and in a more healing state, you can alter your diet and get your pH balance back on track. Foods to avoid are meat, dairy products, soft drinks, coffee, tea, wheat or rye bread, potato chips, and most junk food. To get your body in a more alkaline state, consider adding these foods to your diet: grapes, watermelon, lemons, raisins, and vegetable juice. By practicing good oral hygiene, gently brushing your teeth, and avoiding toothpaste and mouthwash with SLS, you can greatly cut down your chances of developing those pesky canker sores. If you’re currently suffering from canker sores and it’s ruining your life, don’t despair. By using healing essential oils, you can not only get fast relief but also cut down your healing time considerably. This essential oil packs a punch because its antiviral, antibacterial, anti-fungal, and will help clear up those canker sores in a snap. 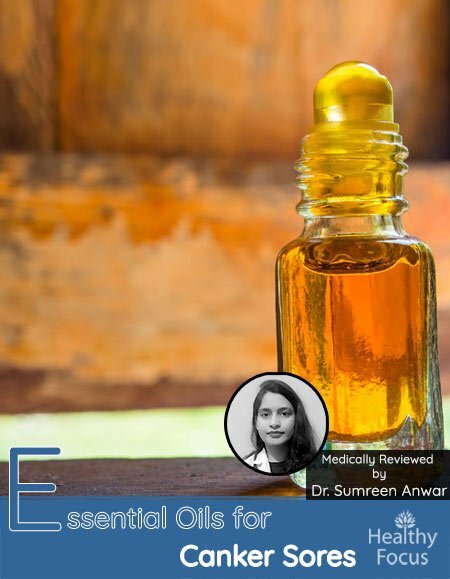 Some people may find this oil unpleasant to use because of the fairly intense heat sensation they feel upon application, however, this sensation disappears after about 2 minutes. You can apply a drop directly onto the sore and leave on for up to 10 minutes. Continue application until the canker sore is gone, which is usually by 2 or 3 treatments. The numbing agents in clove oil provide sweet relief to painful canker sores. Clove essential oil is an especially effective canker sore remedy and the internet is full of glowing testimonials from those who it has helped. Clove oil is especially well known for its ability to numb the dental and oral pain so it is perhaps not surprising that it can provide relief for to those battling with canker sores. Many people experience an initial, very brief burning sensation after applying clove oil. The feeling should subside within a minute and then its pain-relieving actions will really get to work and annihilate your pain. Not only will clove oil destroy the pain but it will also help heal the sore completely. Many people have found that their canker sores are totally healed in as few as 24 hours. There really are few better natural remedies than clove oil so if you are suffering from canker sores, what are you waiting for? Tea tree oil is a fantastic way to immediately numb the pain of a canker sore and to kill any bacteria in and around the wound. Tea tree oil has strong antibacterial properties and is used to treat a variety of bacterial and fungal infections. Simply apply a drop or two of tea tree oil to your canker sore and you should find quick relief from the pain as well as experience a rapid healing process. When applying the oil directly to the canker sore, make sure not ingest any of it. By applying helichrysum oil directly to the canker sore, you can experience immediate relief. About 2 or 3 drops should do it. Thieves oil is a blend of essential oils that packs a wallop and addresses all problems associated with canker sores. Together, these oils address the pain associated with canker sores, boost your immune system, and cut down the healing time. Thieves oil is a blend of the essential oils clove, cinnamon bark, lemon, eucalyptus radiata, and rosemary cineol. Thieves can be applied directly to the canker sore, or if you are experiencing an outbreak, you can gargle with a couple of drops. Lavender essential oil is one of the most popular and widely used of all the essential oils. It is known to be one of the safest oils on the market and the list of its therapeutic applications seems nearly endless. You will hardly be surprised to see lavender on this list for canker sores as lavender essential oil has excellent antibacterial and antiseptic properties ideal for dealing with canker sores as well as analgesic properties that help dull any pain. Lavender essential oil is considered to be very safe but you should still try to avoid swallowing any of it when applying it to your canker sores. Melissa essential oil is also known as lemon balm oil and while it might not have quite the same reputation as lavender oil in general, many people consider it to be among the best natural treatments for canker sores. Melissa has excellent antibacterial qualities that can help treat any infection and help speed the healing process of your sores. Try applying a few drops of Melissa oil to your canker sores several times a day and if the testimonials are to be believed, you could see improvements within a very short time. While it is best known for its effects on congestion and other respiratory complaints, peppermint essential oil can also be used to effectively treat your canker sores because of its anti-inflammatory and antimicrobial properties. Peppermint oil will help prevent the chance of infection from the sore from developing as well as acting as an astringent and tightening the tissues surrounding the wound. And what is more, peppermint essential oil has excellent cooling actions which can help numb the pain emanating from the sores. Eucalyptus oil has a wide range of medicinal benefits; it has potent antimicrobial and anti-inflammatory benefits well suited to treating oral infections like canker sores as well as being among the best natural pain reliefs known. It can help by easing your pain, killing any existing infection and preventing the likelihood of any future repeat infections. It combines especially well with peppermint essential oil to treat canker sores (see spray recipe below). Eucalyptus has the highest known cineole concentration in nature (between 80 and 90%) which gives it so many of its outstanding medicinal benefits. Niaouli essential oil is the lesser known cousin of tea tree oil. It also derives from Australia and possesses a great number of medicinal properties including antibacterial, antiseptic and analgesic properties. It has natural pain relieving ability along with its excellent antibacterial properties make it a great choice for treating your canker sores. It can ease any pain that you are feeling as well as destroying the bacteria responsible for your sores and protecting against their recurrence in the future. Melrose essential oil is made with a combination of 4 different essential oils; tea tree, niaouli, rosemary, and clove essential oil. This is a powerful combination incorporating all of the individual benefits of the 4 oils. Melrose essential oil is a powerful antibacterial combination which is often used to treat skin conditions but it has many other uses too including oral hygiene and the ability to treat your painful canker sores. Many people have used melrose oil on their canker sores to great effect. You should dilute your Melrose oil with a carrier oil like coconut oil before applying it to your sore. Alternatively, you can make a gargle preparation by adding a few drops to a glass of water but be careful not to swallow any of it as most essential oils should not be taken internally. Another essential oil shown to be an effective remedy for canker sores is Sandalwood Essential Oil. You can make your own DIY numbing spray to treat your canker sores by following a few very simple steps. 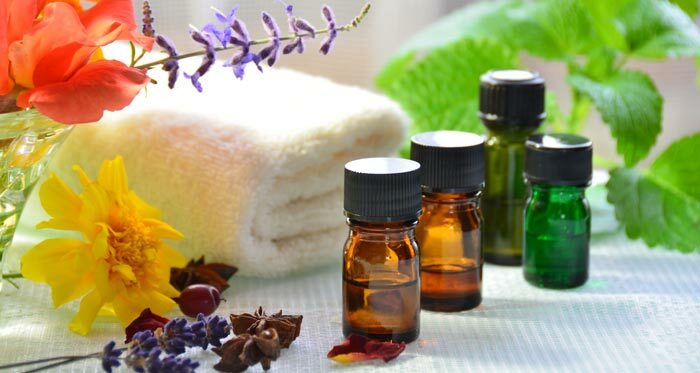 Any combination of the essential oils mentioned above should work but one of the best home-made spray treatments combines peppermint and eucalyptus oil. Both of these essential oils have powerful antimicrobial and anti-inflammatory properties that can help soothe any pain and reduce the risk of repeat infection. They are also natural astringents which will help tighten and heal the tissue surrounding the sore. Both have wonderful cooling properties and an ability to numb the nerves and dampen any pain. Pour your grapeseed or olive oil into the glass bottle. Add your essential oils and mix thoroughly. Spray directly onto your canker sore whenever necessary for immediate pain relief. Sore the bottle in a cool place and make sure you shake it well before each use. You can apply essential oils directly to your canker sore by placing a drop on a clean finger and applying directly to the sore. Reapply 2-3 times a day until your canker sore is gone. Some people may find essential oils to be too strong and may use a carrier oil to dilute it. Due to its antibacterial and antifungal properties, coconut oil is a great carrier oil to use. Warm a bit of coconut oil in your hand, mix in a drop of essential oil and then apply directly to your canker sore. Saturate a cotton ball or a piece of gauze with essential oil and coconut oil and hold it to the canker sore for a few minutes. This method can be employed several times a day until the canker sore is gone. Gargle with a few drops of oil and water if you feel an outbreak coming. Chamomile tea bags-Chamomile tea has a compound known as levomenol which possesses antiseptic and anti-inflammatory properties that can help treat and hopefully speed up the healing of your canker sores.Soak a chamomile tea bag in hot water for a few minutes, allow it to cool and then apply it directly to your sore for 10 minutes or so. Repeat this process twice a day for as long as is necessary. Manuka Honey-While any good quality honey has antimicrobial actions, Manuka Honey is especially effective in healing wounds and preventing infection. To use Manuka Honey on your canker sores, wash out your mouth with clean water then apply a dollop of honey directly to your sore twice a day. Virgin Coconut oil-Coconut oil is great for you, especially the healthy organic virgin variety. It is also incredibly tasty. When it comes to getting rid of canker sores naturally, you can’t go wrong with this treatment. Treating your canker sores with coconut oil could not be easier. Simply take some coconut oil with your fingers or put some of it on a cotton swab and apply a liberal amount directly to your sores. Coconut oil tends to melt very quickly so make sure you apply a thick layer to the sore. Coconut oil--Coconut oil can help treat canker sores in many ways. First, Coconut oil is an anti-inflammatory–so it can help reduce swelling and inflammation. Second, Coconut oil has Antiviral and Antibacterial properties that may help manage unwanted mouth flora. To use organic coconut oil use typical oil pulling techniques; take a teaspoon of coconut oil and swish it around in your mouth for 15-20 minutes.